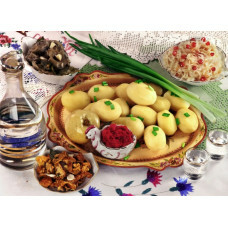 Russian Cuisine is considered quite healthy and is generally liked by foreigners. The most famous courses include Borscht (a beetroot soup), Oukha (fish soup) and Solyanka (a thick soup with an assortment of meats and sausages) for soups; Pelmeni (a sort of dumplings), Bliny (Russian pancakes), Boiled potatoes with pickled vegetables, and Pirogi (pies) for the main course; Mors (berry beverage) and Kvas(alcohol-free beverage made from bread) for beverages; and, of course, Vodka and Caviar! You will be provided with a wonderful opportunity to get familiar with the traditional Russian Cuisine. A Russian Cuisine restaurant chef will tell you about the history and the cooking secrets of Russian national courses, which you may be sure to cook by yourself and taste afterwards!